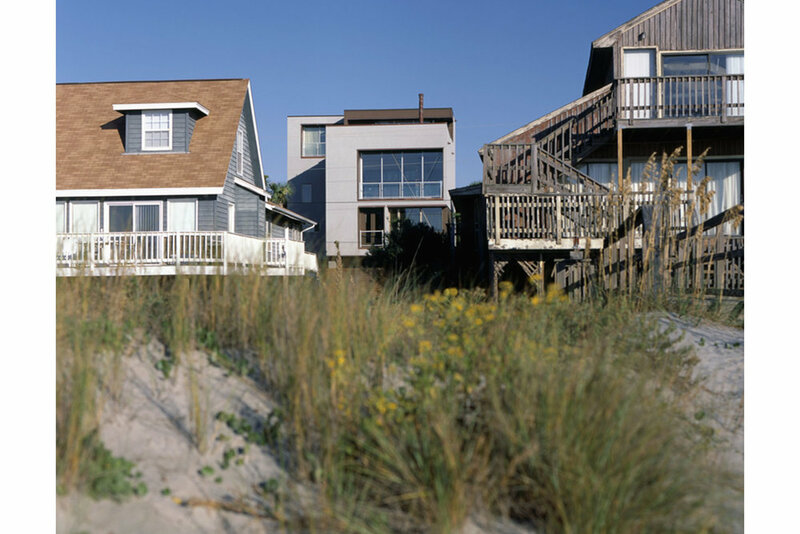 How do we turn a second-row beach lot into an oceanfront living experience? Inspired by the beach jetties, the linear body of the home is used like a camera lens to foreshorten the viewing distance to the water. The design diverts from the neighborhood’s ubiquitous built-on decks and pitched roofs by treating the roof as an occupied surface, and using negative space to carve out balconies shielding the interior from the summer sun. Inside, an open staircase with integrated shelving stretches three-stories and choreographs movement through the house to maximize the visual experience of the site. Moving between the first-floor office and the dining room above, one sees primarily water and foliage. Selectively placed windows on the east and west walls reinforce telescopic views while providing complete privacy. The staircase culminates at the roof deck, which appears to merge with the ocean from the house’s master suite.